Part 1 offered an overview and introduction to the blog series. Part 2 discussed Kiss Coaters and Squeeze Roll Coaters. Part 3 went through Gravure Coating, Offset Gravure Coating, and Reverse Roll Coaters. Part 4 will wrap the series up, finishing with Transfer Roll Coaters and Other Roll Coaters, and then offer a brief Conclusion. Transfer roll coaters are typically used for applying thin coating layers, particularly as required for 100% solid coatings. These coaters typically use 4, 5 or 6 rolls, with each consecutive roll running in the opposite direction of the previous one. The rolls in the stack alternate from rubber covered to steel surface rolls (typically chrome plated). The web is supported by the last roll in the series, which is referred to as the backing roll and runs at web speed. The web passes between the backing roll and the next to last roll, referred to as the applicator roll, which also typically runs at web speed. 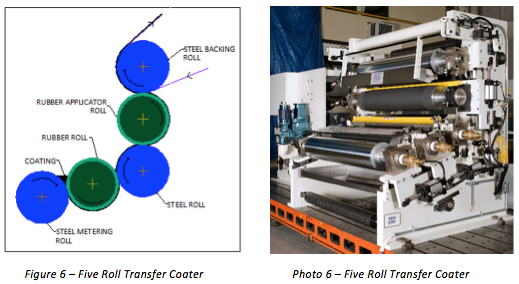 The coating is typically placed in the gap between the first two rolls, with the first roll, referred to as the metering roll and the second roll both rotating away from the coating puddle (Figure 6 and Photo 6). Each roll from the metering roll through the applicator roll runs faster than the previous one, with the coating continuing to be reduced in thickness by the combination of the gap between the rolls and the increase in speed. The coating is transferred from the applicator roll to the web as it passes through the gap with the backing roll. Table 6 (below) shows the typical operating speeds, coating application rates and coating viscosity for a transfer roll coater. 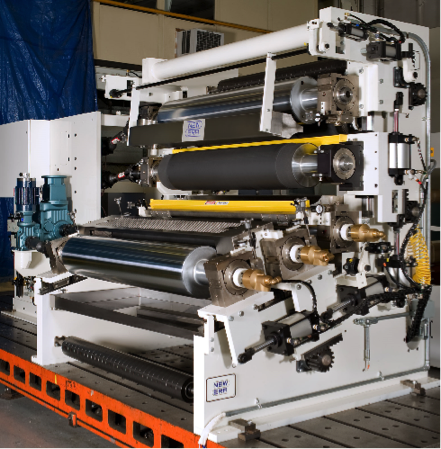 The transfer roll coater is an expensive coater to purchase. It has a very good speed range and has fairly wide coating thickness and viscosity ranges, though it does not work well with low viscosities. In particular it is very good for thin coating laydowns, particularly at high speeds. It is good for changing coating laydown rates. Because it does offer the ability to change the coating laydown rate, it can be a somewhat difficult to operate and can have issues with repeatability of coating rates. It typically requires a fair to high amount of maintenance. Because of the number of rolls involved in the coating application change over from one coating to another/clean up can be time consuming. There are many other roll coater configurations that have been developed to meet a wide variety of coating applications. Many of these are either hybrids, variations or combinations of the previously described coaters. One such example is a dip coater which in its simplest form is similar in design to the kiss coater except that the web passes beneath the roll where it is dipped into the coating being held in the pan. Like the kiss coater, it is typical that a metering device/system follows the application of the coating. Another example is a coater that uses a die to feed a coating to the surface of an applicator roll, which then transfers the coating to the web. 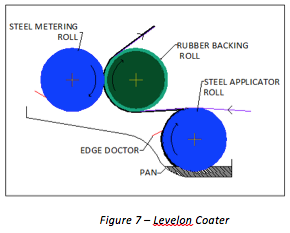 Still another example is commonly referred to as a Levelon Coater (Figure 7) which can be considered a combination of kiss and reverse roll coating, where the coating is applied to the web by a kiss roll and is then metered off as the web passes between a backing roll and a reverse running metering roll. A final example is as shown below (Photo 7). 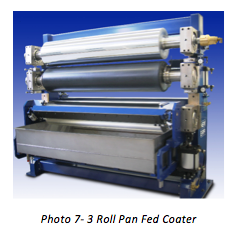 This three roll pan fed coater combines many of the features of a squeeze roll coater, an offset gravure coater and a transfer roll coater to obtain the desired coating laydown. As illustrated above, there is a wide variety of roll coaters that has been developed through the years. Each of these coaters present certain strengths and weaknesses. It becomes important to select a coater that that best matches the coating being applied as well as the parameters of the operation. Bob Pasquale is one of the founders and principals of New Era Converting Machinery, where he serves as President. He holds a degree in Mechanical Engineering from Stevens Institute of Technology and has worked in the web converting industry since 1985. He is the holder of several patents in the industry. Bob can be reached at bob.pasquale@neweraconverting.com.